This tank puzzle was posted by us back on July 28, 2017, and it has taken the internet by fire. 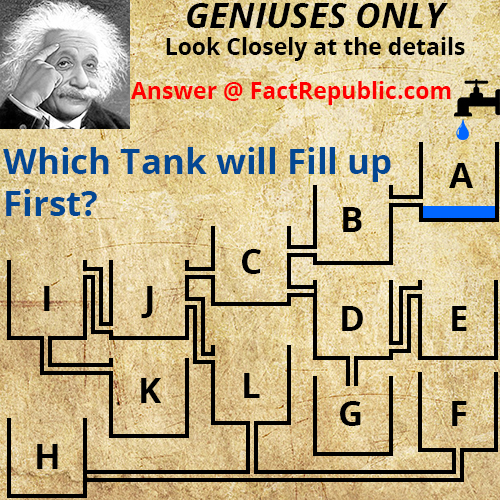 If you are looking for the answer to puzzle with the headlines ‘which tank will fill up first’, you will find it here. Who doesn’t like puzzles? Especially simple puzzles like this one. Back in July, I was bored out of my mind and started creating this simple tank puzzle to kill some time and post it on our facebook page. What I never expected was how popular it was going to get and boy were people interested to know what the answer to this 12 tank puzzle was. I intentionally sealed off the intake pipe for D and H.
I didn’t really care about the speed of water discharge from the tap or the width of the pipe. Only thing I had in my mind when creating this puzzle was that this was going to be a logical puzzle and the answer was going to be based on simple water dynamics (how the water flows) and gravity. From the get-go, I wanted the F bucket to fill up first and so, therefore, created the layout for the pipes in a way which would satisfy my goal of filling the F bucket first. 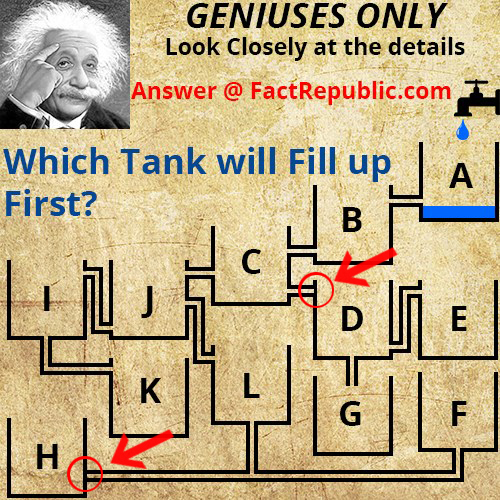 So logically, Which Tank Will Fill Up First? As soon as the level of water in the bucket A reaches the pipe feeding B, it will start flowing and filling up B and then logically C will start filling up. Now C has two pipes that will drain the water out of it. As shown in the above pic, the pipe feeding D is blocked, none of the buckets it feeds will fill up (i.e., D, E & G). So water will logically start filling up J. Now J again has two pipes draining water out of it. Now, here most people think, the bottommost pipe will drain the bucket J, but the pipe draining out of it feeds I at the top of the bucket. According to simple fluid dynamics, I wouldn’t start filling up unless and until J fills up to the same level as the pipe feeding into I. But before J fills up to the top, the pipe feeding L will drain water out of it, which will make sure J doesn’t fill up to the brim. From there on, the answer is simple. H is blocked and the bucket F will fill up first. And Which Tank Will Fill Up First in the Real World? Nothing is going to beat the real world physics, right? So when the puzzle went viral, a California based 3d Printing Company Prozix made a 3d printed model of this puzzle and introduced water to the system to find out which tank would fill first in the real world. Here is the video they made. So again F filled up first. So that settles it that the answer is F both logically and scientifically. If you answered F, you are correct. That took less than 5 seconds to solve. Not bragging, just reporting the facts. Hard to believe there was any argument about it but then again, my country elected Donald Trump so I guess anything is possible. Unless an air bubble/blockage forms then it would be L. OR if the water is turned on full blast it would be A. Bet you anything an air blockage happens. Otherwise, yes, it would be F…..gravity feed is simple to figure out. Stupid people voted for Trump. Stupid people voted for Hillary. Smart people voted for Trump. Smart people voted for Hillary. Smart people know this.